“I think I might be depressed,” he told me. I wasn’t convinced. When Brian was talking, it seemed he was searching more than he was lost. 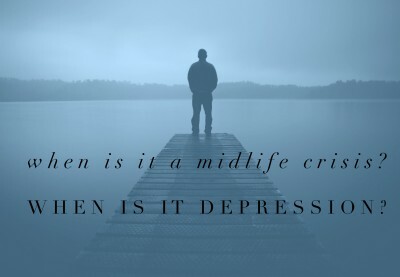 Depression, unhappiness, and a midlife crisis can look very similar. But they are very different. And the way through each is different. Brian felt depressed. But in reality, he was trying to figure it all out. He was in a crisis. He didn’t need to be treated for depression. He needed to get through his midlife crisis. Sometimes, people hit midlife, and it IS depression. If you (or someone you know) is at midlife and not sure if it is a midlife crisis, depression, or just unhappiness, let’s talk about the differences. Each has a different path.